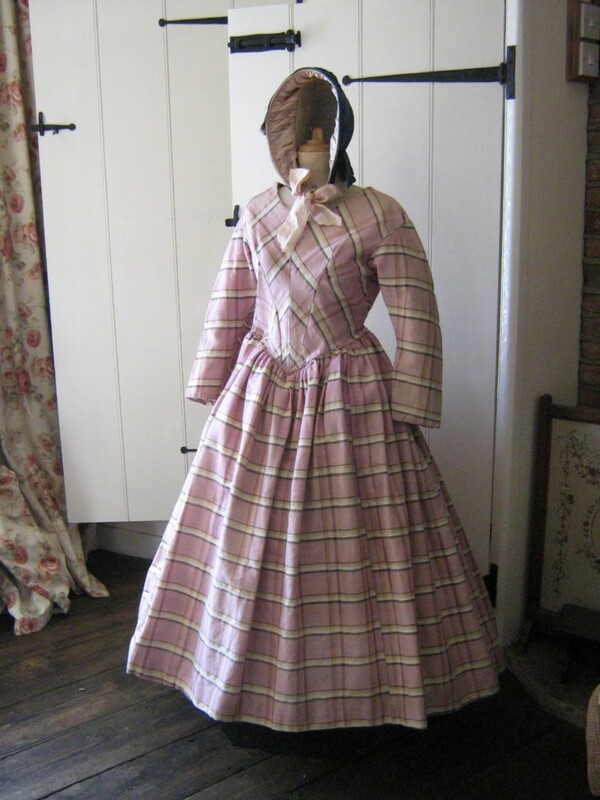 This very charming and pretty pink check gown is completely hand made and dates to circa 1840, so at the very start of Queen Victoria's reign. 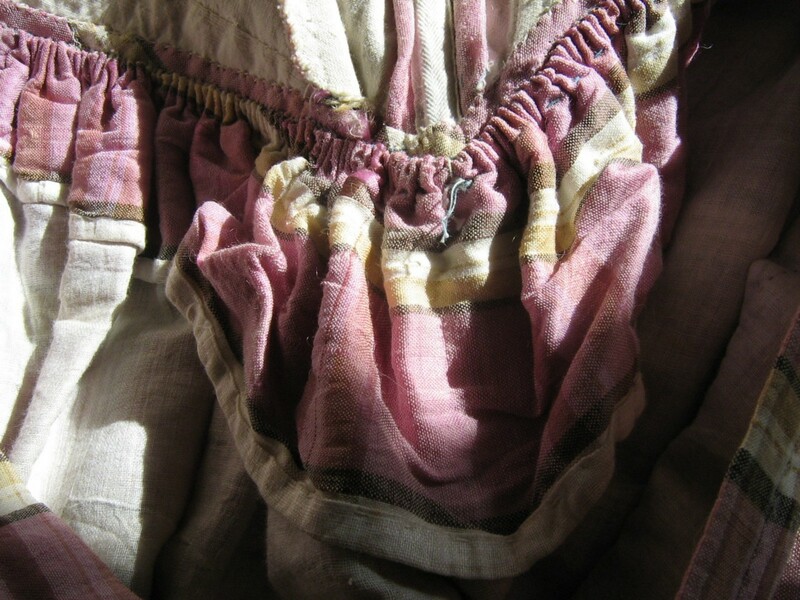 The auctioneer said that the fabric is 'glazed wool' but it feels very silky to me and I wonder if it may be fabric from Kashmir - a silk and wool mix? Not sure, but very lightweight and fine. The lack of staining and discolourment is the first thing you notice - it is amazingly clean for it's age, inside and out. 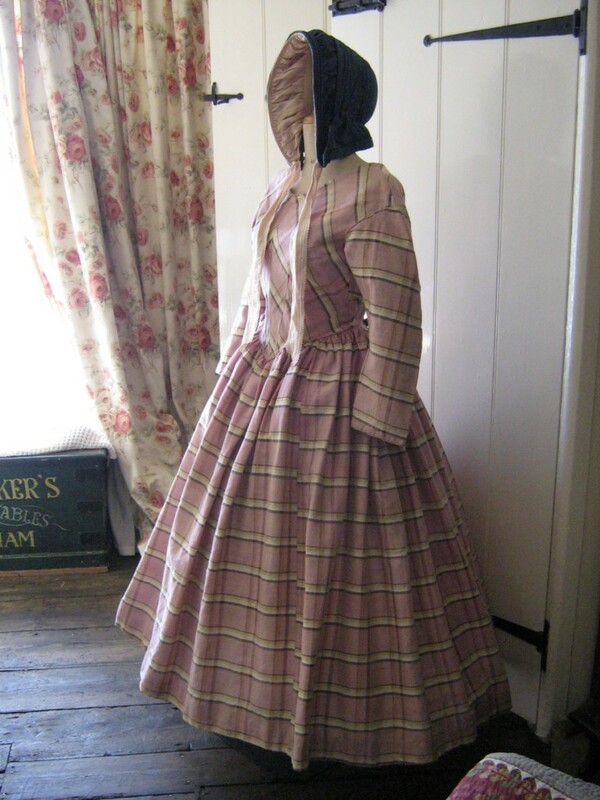 There is also very little fading of the lovely pink colour, the bodice being just a little paler than the skirt perhaps. The gown has a generous waist for a Victorian lady and I had to resort to using pins to try to make it look in proportion on my undersized model. 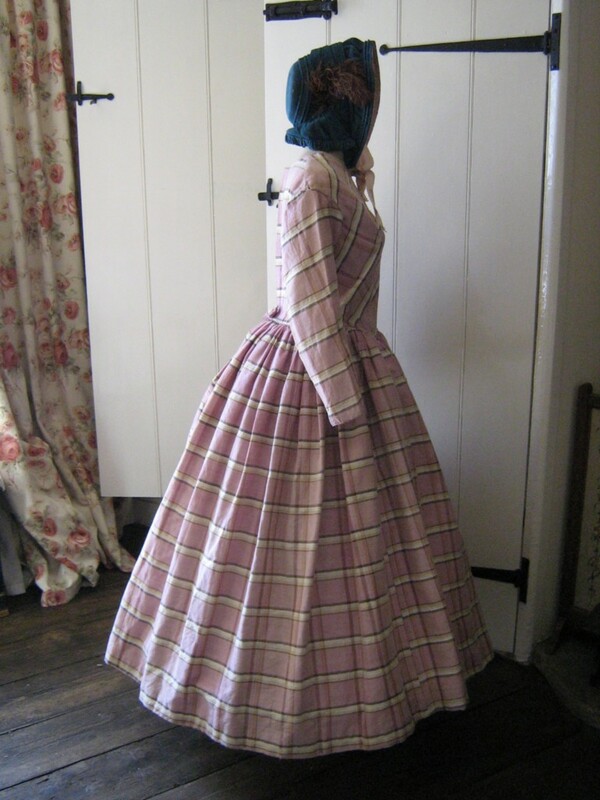 The actual measurements are: chest 34", underarm sleeve 17", waist 31", skirt length 37" The dress is quality made with piping to the arms and waist and a delightful little bow at the back waist. In true Jane Eyre style, it is crying out for a beautiful lace collar and cuffs; you will also notice that it is quite short, with masses of opportunity to display flounced and embroidered petticoats underneath. It reminds me of pictures of 'Mary had a little lamb' - I wonder when this little rhyme was written? It will be an absolute pleasure to accessorise it! 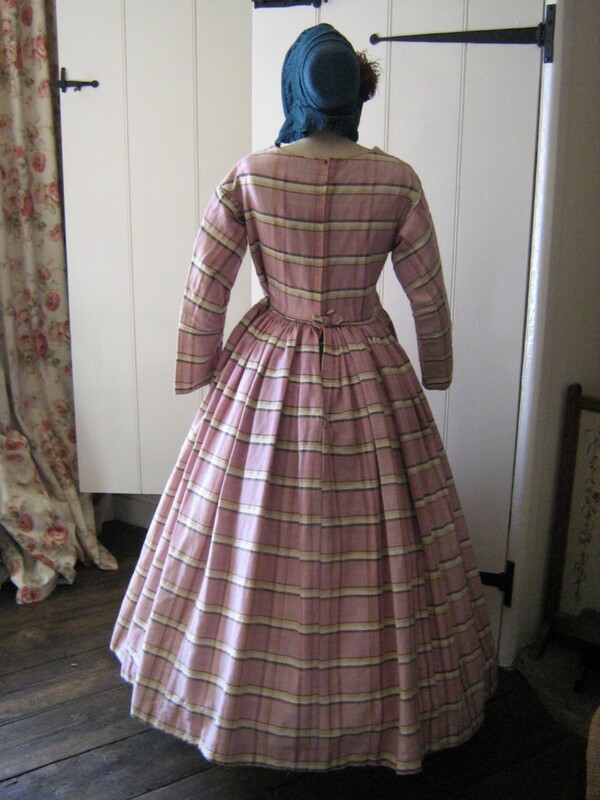 It is very, very deeply gathered at the waist and I have used a crinoline under, which is totally inappropriate but shows the vast width. A nice deep pocket is hidden in the skirt volume. 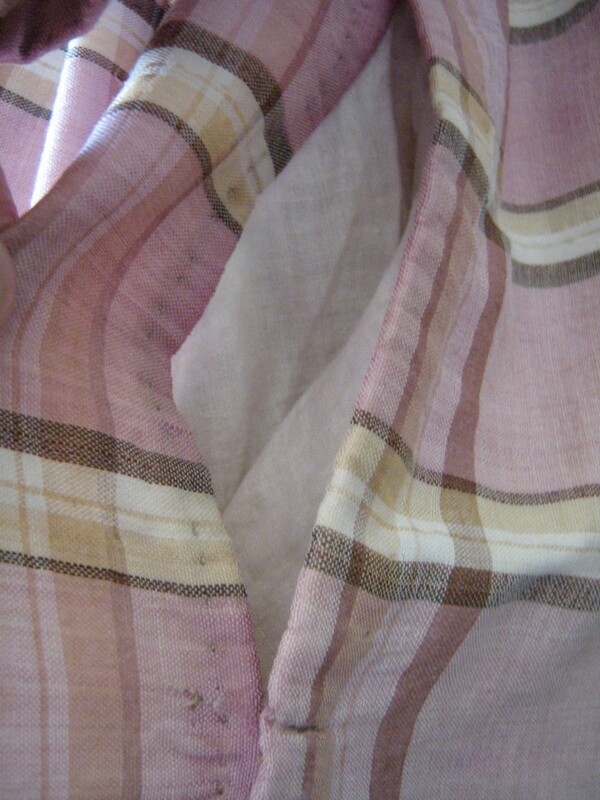 It also has has a full cotton lining in excellent condition. This is important for the following reasons: *The fine wool and silk has no moth holing that I can find. Remarkable. *However, it does have fraying. * The skirt is in excellent condition with just a small area of fraying within the volume and a slightly larger hole just below the waist. See pics. 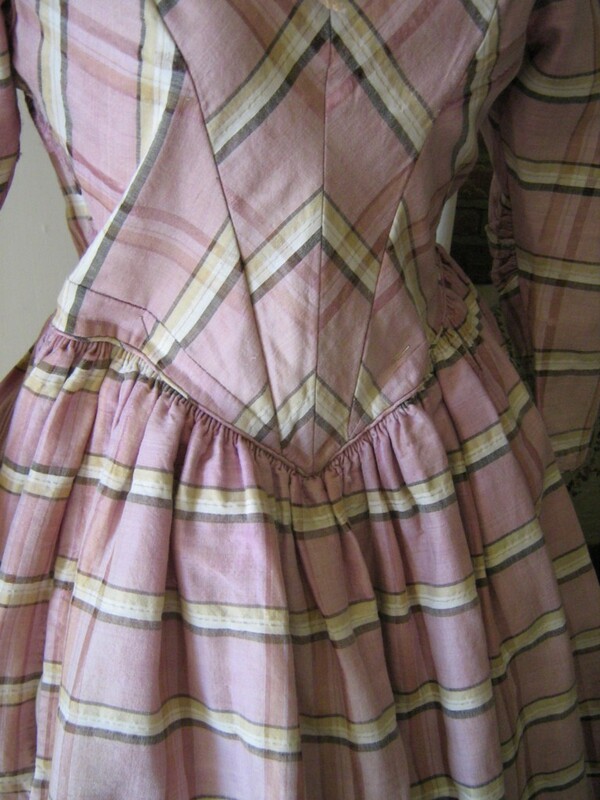 * The bodice body is quite strong but look closely and some of the thinner rows of the check pattern have lost their weft threads. Not many but needs to be mentioned. The warp is holding well. 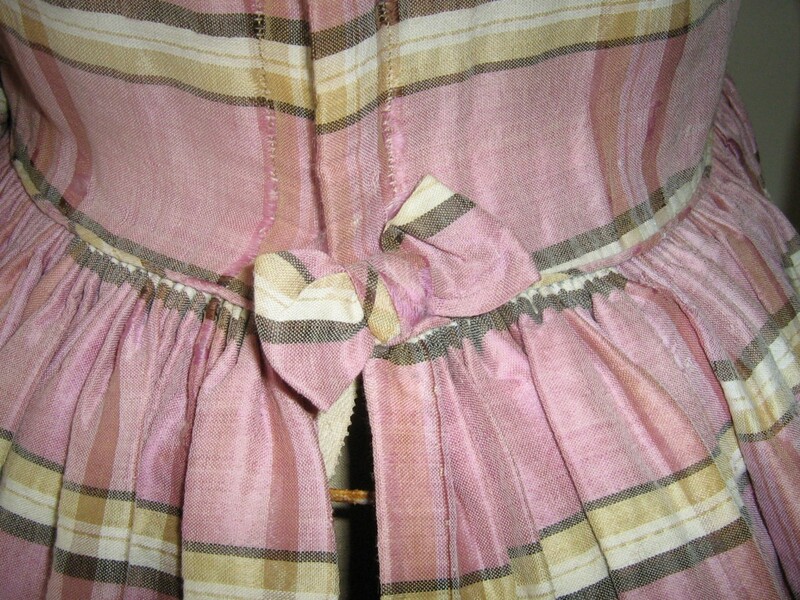 *The worst of the fraying is at the neck, bodice sides and underarms. The neck will be covered with that lace collar you will apply! The bodice sides could be taken in a little if the waist is too big for you. Otherwise I will send some antique very fine braid. This will cover the fraying and protect it. Each underarm has a frayed hole as well as general fraying. This is where the strong lining come in. Sew with small hand stitches around the holes to attach the top fabric to the lining. This will prevent further wear. If you really want to patch it, there is generous fabric inside the waist at the skirt gathers, but I don't think this is worth it. Finally, I think that the hook & eye fastens are antique but I think a later date. No matter. Wearable with care then on the special occasion, and wonderful for display. *Please note that the bonnet is not included in the sale. Honestly, I thought this was recreation at first. 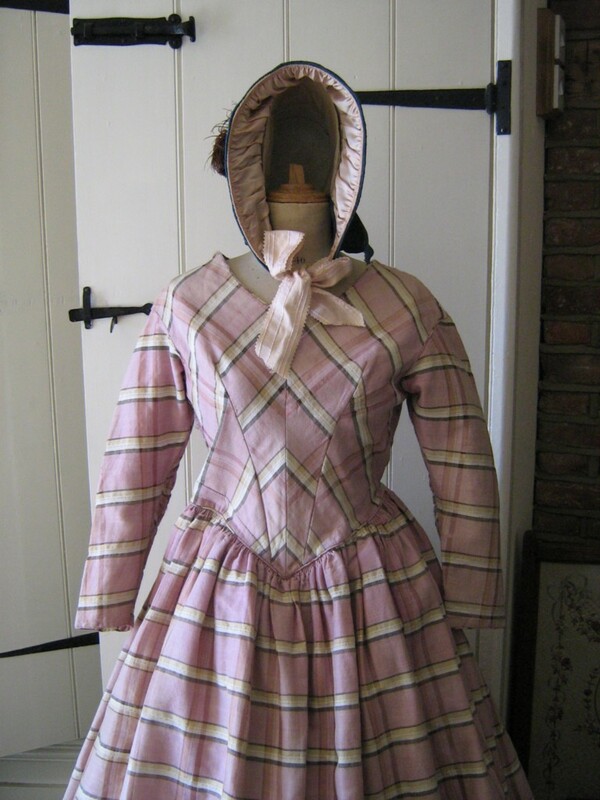 It wasn't until I saw some of the pictures of fraying (I didn't include them) that I realized this was a real 1840's dress!